NEXT | Could WoW battlegrounds be less frustrating? World of Warcraft caters to many kinds of playstyles, but not everyone wants to do it all. Well, some people want to do it all and there’s an Achievement Discord for them. For the rest of us, we pick and choose what we want to do and, more importantly, what we don’t want to do. For me the big three I avoid are PVP, Archaeology, and pet battles. PVP was never my style, though I did dabble in War Mode this expansion and liked it. I might look into doing the weekly PVP quest for the 400ilvl reward if I can find a group to run with — and if it keeps being offered. Archaeology is mainly centered around activities I like the least in games: spot the (partially) hidden object or solve a puzzle. Then it added the agony of jumping on platforms as a requirement. I would like to kill for my loot, thanks. 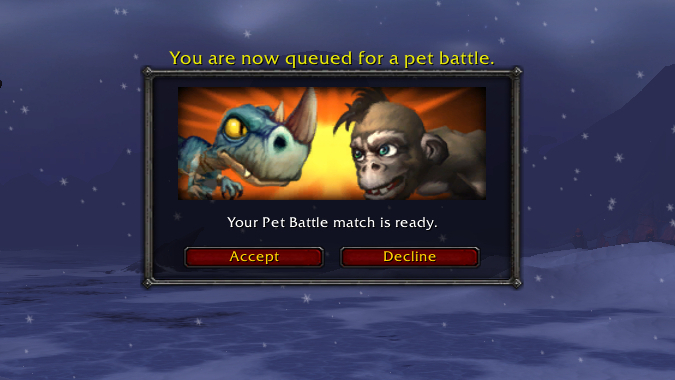 And as for Battle Pets, the intricate rock-paper-scissors system just seems too complex to keep track of. Though now that I write this, I’ve been getting more into collecting transmog drops, pets, and mounts by farming old raids. There may come a time when I need to dive into Archaeology and pet battling if I want to round out my collections. But until then, I have plenty of old raid drops to try for. What in-game activities do you avoid like the plague? Raiding? Professions? Debating the legitimacy of Sylvanas as Warchief in General chat?